You will have general anesthesia . You will be asleep during the procedure. Ask your doctor when you can start wearing a light-weight prosthetic breast. You can be fitted for a more permanent one when the site has healed. If you want a reconstruction , talk to your doctor. Axillary lymph nodes. Breast Cancer website. Available at: http://www.breastcancer.org/pictures/breast%5Fanatomy/axillary%5Flymph%5Fnodes. Updated September 17, 2012. Accessed December 18, 2017. Breast cancer in women. EBSCO DynaMed Plus website. Available at: http://www.dynamed.com/topics/dmp~AN~T113654/Breast-cancer-in-women . Updated October 20, 2017. Accessed December 18, 2017. 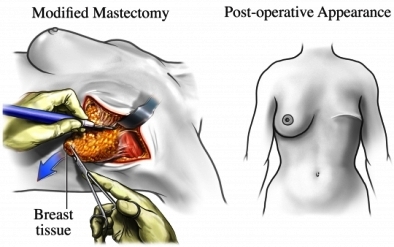 Surgery for early and locally advanced breast cancer. EBSCO DynaMed Plus website. Available at: http://www.dynamed.com/topics/dmp~AN~T901192/Surgery-for-early-and-locally-advanced-breast-cancer . Updated May 31, 2017. Accessed December 18, 2017.